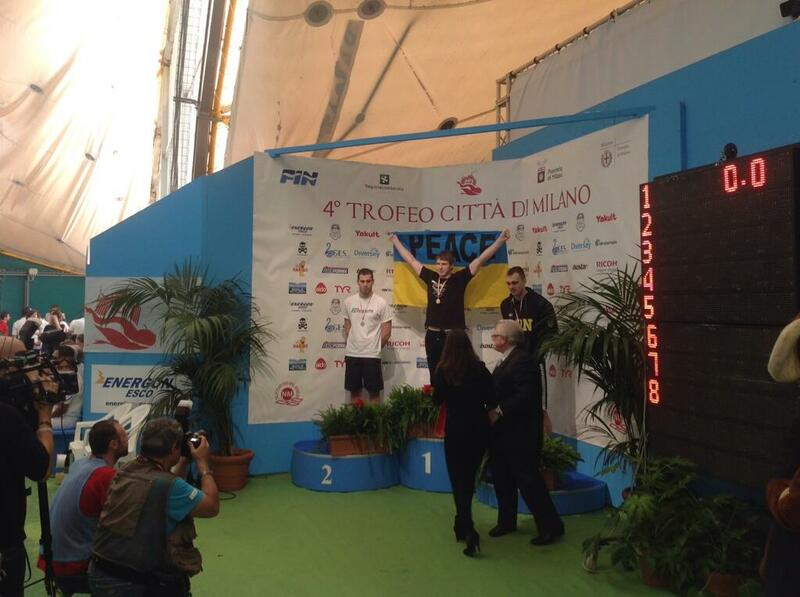 Ukrainian swimmer Andrey Govorov, who is a part of the Italian-based ADN Swim Project, is racing at the Copa di Milano this weekend, and after his win in the 50 long course meter butterfly, he unfurled a flag from his native Ukraine with the word “Peace” scrawled across it in large black lettering. The time was a 23.76, topping Italy’s Piero Codia (24.15) and teammate Sergey Fesikov who swam a 24.35, but the statement was even bigger. There were photographers and videographers from Italian media on hand who were suddenly in a flurry to connect the meet to the broader world, and Fesikov gave them a reason to. The reference was to the ongoing crisis in the Ukraine, where a domestic revolt against the national government has become even more complex with the uncertainty about Russia’s intentions (or even presence) in the Crimea region: a region that has seen so much horror from war in its history. In the later podium ceremony for the 50 free, also won by Govorov in 22.66, it could be seen that there was no flag present on the picture. That was just part of the excitement on a great day in Milan that saw a lot of fast swimming. Olympic Nice’s Camille Muffat took wins in both the 100 free (55.44) and the 400 free (4:08.35), the latter of which ranks her in the top 10 in the world this year. Hungarian Gergo Kis swam a 3:48.43 to win the men’s 400 free, which is a fantastic time for the swimmer who tends to specialize in the 1500. It’s two seconds faster than he was in all of 2013, and beat Italy’s Gabriele Detti, who placed 2nd in 3:51.11. Federica Pellegrini continues to waver between the freestyle and backstroke events. She swam neither the 100 nor the 400 free on this day, but did win the 100 back in 1:01.03. Full, live meet results available here (in Italian). Decent 4.08 for Miss Muffat. Not fabulous but decent. I don’t see her swim that event at the world championships and at the olympic games.